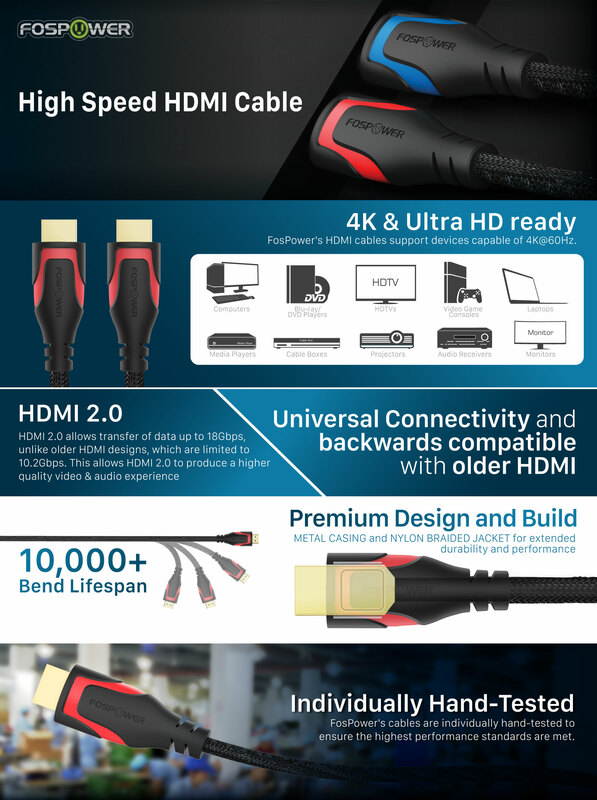 [ULTRA HD 4K HDMI CABLE AT A GREAT PRICE] FosPower's HDMI 2.0 cable supports true 4K@60Hz. This cable is able to output Ultra-High-Definition (UHD) and support High-Dynamic-Range imaging (HDR) for high-quality video. [INDIVIDUALLY TESTED HDMI CABLE] Each FosPower HDMI cable is individually tested to ensure high standards met. [DURABLE BUILD] This flexible and tangle-free HDMI cable has a nylon braided jacket that is ideal for tight environments. 24K gold-plated connectors help resist against corrosion and reduce tarnish for full transmission quality. FosPower's 4K HDMI Cable supports true 4096 x 2160 resolution @ 60Hz, providing the sharpest clarity and provides a significant boost over 1080p. 4x the pixel density means sharper, clearer, and more vibrant images and videos. 60Hz refresh rate is supported for the smoothest picture when paired with 4K. This cable supports High-Dynamic-Range imaging (HDR) allowing for the high-quality video. FosPower's HDMI cable meets HDMI2.0 standards, supporting 4K at 60hz and transfer rates up to 18Gbps. Older HDMI cables can only support up to 30Hz. For maximum quality, this HDMI cable has been tested and certified to transmit video and audio over the full 18 Gbps bandwidth and pass an EMI (electromagnetic interference) noise test. Each FosPower HDMI cable is hand-tested to ensure it performs at its best. Unlike other manufacturers, our cables are guaranteed to meet standards and not tested by batch. This 4K HDMI cable has a nylon braided jacket which provides the best durability available. The flexibility of the cable allows it to work in tight environments while remaining tangle free. The copper conductors are protected within and are 99.99% oxygen-free to prevent signal degradation. Connectors are gold-plated for added resistance to corrosion and tarnish. Your satisfaction is our priority. Got an issue? Reach out to our USA based customer support 24 hours a day, 7 days a week. Please refer to FosPower website for more information.